The function of an educational institute is to provide you with formal knowledge of your entire field. The field of event management is quite huge as there are different events that vary in size and form. In mastering such a huge field, professional help might turn to be greatly beneficial. At formal institutes, such as, national institute of event management, you will be getting a complete view of what event management is. You will know what event management precisely is, what challenges are likely to arise, and how to deal with them. With formal education, you will be devoting the significant amount of time with your own subject, thus enabling the development of event management related knowledge body. In short, your institution, by making you spend enough time, will make you an expert in various aspects of event management. There are large numbers of institutes of event management in Mumbai and in other parts of India. Choice always produces confusion, but I have one simple solution. Fredrick Nietzsche said that the purpose of education should be learning to see, think, and write or speak. At National Institute of event management, you will learn to see the world and events like an event manager; think like an event manager; and speak, rather interact with the world like an event manager. Anyhow, learning these skills without proper supervision is clearly difficult. This is because you consistently need someone to remind you of your mistakes so that you can improve upon them. Without practice, there is no event management education. 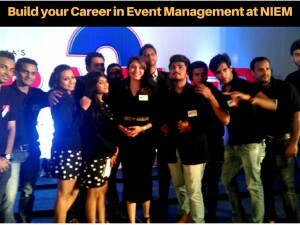 What better place to learn event management than learning it in the event capital of India. Institute of event management in Mumbai will give you sufficient opportunity to work on some of the biggest events in India. This will prepare you to deal with any with any probable uncertainties in your future events. By selecting an event management institute, you will be acquiring a complete knowledge of your field, expertise in dealing with various problems, and an invaluable experience of dealing with high-profile events.